Though the world doesnt know it yet, it has never been easier to publish a book. The development of e-books and print-on-demand technology allow us all to get our message in print. But how do you make money with your book? Inside you will learn more than twenty strategies to make money with your book. Some of them involve book sales while others involve leveraging you book for greater profit. All are actionable and can be put into motion today! Start reading Books to Bucks on your Kindle in under a minute. I picked up some great ideas from this book, which is well written and well researched. Unlike most books on this topic, every single thing explained is relevant to an author's situation. Books have become the new business connection tool. They are so easy to produce and send out to the world that it is amazing that more people aren't doing it. 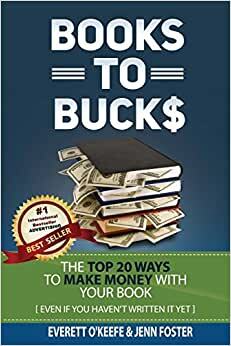 Everett O'Keefe and Jenn Foster, in their new book Books to Buck$, have outlined 20 great techniques plus some bonus ideas on how easy it is to use a book to build your business. They highlight capturing leads, the 100 page flyer, using your book as a business card, getting past the gatekeeper and many more. As the author of over 30 books myself I fully understand the power to spread your message out to the world. Books can be produced digitally or in paperback through services like Kindle and CreateSpace and spread out through your website, social media and video. Let your customers know what you stand for and how you work by producing a book and then use Books to Buck$ to connect. My favorite ideas in this book are Your Book is Your Business Card, Selling on Your Website (I do this a lot) and The Perfect Gift Clients love getting a copy of your book. Ok get working on your book. 5.0 out of 5 starsGreat Insight on how to be sure your book is working FOR YOU!! Being a Marketing Consultant I find in almost every conversation I have with clients and prospects being an author usually comes up! Is having a book really that important for your marketing efforts? My answer typically is yes, but the bigger question is, how are you monetizing your book … otherwise known as … is your book working FOR YOU?? I found that this book gives some great ideas on how to utilize your book so its working for you! With it being a quick ‘easy’ read it allowed me to make sure I am not missing any cool ‘ninja’ tricks when it comes to monetizing books! This book is full of easy to execute ways to use your book to grow your business. Many authors never consider how to use their book as a tool. They think their primary focus should be on book sales. Unfortunately, statistics don't support this when the average non-fiction book sells 7,500 copies and the average fiction selling 5,000. Not really a business opportunity! In every chapter, the authors cover ways to use a book to further and grow a business that far surpasses the royalties on their book's sale. Great list and something I will refer back to when I want to what else I can do. As an author I read a lot of books about making money from your book. I'm always looking for strategies that will help me have an edge. What Everett and Jenn layout in this book is a simple plan to profit with your book. On the surface these strategies almost appear too simplistic but the thing is that unless you've actually gone and implemented these strategies then you really aren't seeing what they can do for you. From high level strategies to get your foot in the door with hard to get access to prospects, to using your book as a business card, this book covers a lot for its short length. If you are an author or you want to be an author, you owe it to yourself to read this book and then go out there and implement these solid strategies. As an author myself, I’m always looking for new ways to promote my book which gives special education advice to parents. So I was delighted when Books to Buck$ popped up with the notice that it was now available for reading. With even a quick glance through the contents, I realized that I could get my book on a number of other sites that I had yet not put it on, that I really needed to do a press release (and the links were provided), and that it was time for both a book signing party and to contact the media. Those were just 4 of the ideas presented — all things that I can probably get momentum on in just a day. For sure, every author ought to be checking out Jenn’s and Everett’s book — even before their own book is completed.